Recently, Metabolic Support UK launched a newborn screening app, which aims to give information on the six Inherited Metabolic Disorders tested via the heel prick test. 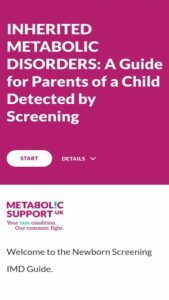 The newborn screening app is there to reduce anxieties amongst parents, by giving new parents more information on their diagnosis and to show the support Metabolic Support UK can offer. Over the past few months, the Core Services team have been busy promoting the app to healthcare professionals, to ensure parents can be made aware of this app, to help ease some of their worries upon their diagnosis. 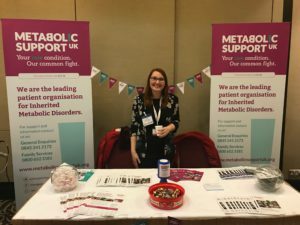 January to April have been a busy few months for the Metabolic Support UK team, from engaging with hundreds of new patients to getting out and about and attending meetings and events. In February, Jess (our Core Services Manager), Helen (our Information Standards Officer), and parent speaker, Kate Jenkins, attended the London Midwives and Maternity Festival in Kensington, to launch the newborn screening app. The event took place on 5th February and was a great opportunity for us to promote the work we do; raise awareness about Inherited Metabolic Disorders; and launch the newborn screening app. We were also invited as guest speakers and did a presentation to a room full of midwives, which was also live-streamed. The event was well attended, with 700 midwives there on the day and 1,200 joining via live-stream. It was a fantastic opportunity for us to raise awareness about Inherited Metabolic Disorders and to talk to midwives from around the UK about the work we do and our brand-new newborn screening app ‘Inherited Metabolic Disorders: A Guide for Parents of a Child Detected by Screening’. Our app received a positive response from midwives, who were keen to share it with new parents following the heel prick test. Our app has been designed by students at Coventry University, Professor Jim Bonham, Professor Louise Moody and Metabolic Support UK, to reduce anxieties and provide factual and accurate information to parents following the heel prick test. It has clear infographics explaining each condition, patient videos and a glossary. New parents can download the app to read about their child’s condition and what to expect next. The app can also be shared with friends and family to further explain the condition and emphasise the importance of following strict treatment protocols. Most recently, Team Metabolic demonstrated the app at the Nutrica DMIMD event in London to dieticians and metabolic specialists from all over the world. Once again, the app received a positive response and attendees were given the opportunity to download it using a QR code. We were also able to give an update about all the services we provide and share some details about some of our upcoming projects. Keep an eye on our website and social media feeds for updates over the next few months! We hope the app will prove a good support to all new parents whose children receive a positive diagnosis following the heel prick test. We are also keen for the app to be reviewed by parents who have already gone through this process, who can give us feedback on its design and functionality. We have many more planned opportunities within the next 12 months to promote the app further and we look forward to receiving reviews and developing it in the future.